Hyde were relegated from the Conference Premier at promotion-chasing Alfreton Town where they slumped to their 30th league defeat of the season. Shaun Harrad's brace and John Akinde's second-half strike consigned the Tigers to the drop with nine games remaining. Greater Manchester side Hyde's only win this term was a 2-0 victory at Welling in January which ended a 29-match winless league run. 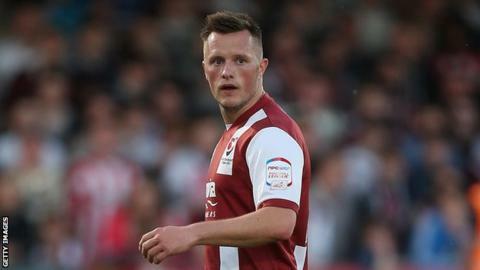 Defeat ends Scott McNiven's side's two-season stay in England's fifth tier. Hyde, who are 23 points adrift of second-from-bottom Tamworth, failed to test Reds goalkeeper Jon Worsnop before the break. Their hopes of keeping what slim hopes of survival they had alive were barely stirred as Liam Tomsett called Worsnop into action on 68 minutes, with the Tigers already 2-0 down. Defender Adam Blakeman twice went close to grabbing a consolation in stoppage time but again Alfreton's keeper was equal to his efforts. "We knew it was going to be a difficult game because they've proved they're a decent team and they've got some forward players, so we knew we had to go out and set the right tempo and I thought we did that. "If I'm honest, I think throughout the game we got a bit sloppy. A lot of players were having too many touches and then you're inviting the tackle and then all of a sudden, you're on the back foot again. "But we certainly did enough in the game to win it far more comfortably than 3-0. I said at half-time, we can't keep missing the chances we're missing, because we paid the price for that on Saturday. "Fortunately they didn't have enough to punish us, where better sides would have done. " Match ends, Alfreton Town 3, Hyde FC 0. Second Half ends, Alfreton Town 3, Hyde FC 0. Attempt missed. Daniel Bradley (Alfreton Town) right footed shot from outside the box misses to the right. Attempt saved. Adam Blakeman (Hyde FC) right footed shot from the centre of the box is saved. Attempt saved. Adam Blakeman (Hyde FC) left footed shot from the centre of the box is saved. Offside, Alfreton Town. Shaun Harrad tries a through ball, but Shaun Harrad is caught offside. Substitution, Alfreton Town. Paul Clayton replaces John Akinde. Attempt missed. Josh Brizell (Hyde FC) right footed shot from outside the box misses to the left. Goal! Alfreton Town 3, Hyde FC 0. Shaun Harrad (Alfreton Town) right footed shot from the right side of the six yard box to the bottom right corner. Assisted by Daniel Bradley. Substitution, Hyde FC. Jake Pollard replaces Adam Thurston. Foul by Godfrey Poku (Alfreton Town). Attempt missed. Michael Wylde (Alfreton Town) header from the right side of the box misses to the right. Assisted by Josh Law. Substitution, Alfreton Town. Bradley Wood replaces Andrai Jones. Hand ball by Michael Wylde (Alfreton Town). Attempt blocked. Shaun Harrad (Alfreton Town) right footed shot from outside the box is blocked. Offside, Alfreton Town. Danny Meadows tries a through ball, but Danny Meadows is caught offside. Attempt saved. Liam Tomsett (Hyde FC) right footed shot from outside the box is saved. Offside, Alfreton Town. Daniel Bradley tries a through ball, but Daniel Bradley is caught offside. Substitution, Alfreton Town. Danny Meadows replaces Connor Franklin because of an injury. Foul by Danny Carlton (Hyde FC). Nick Fenton (Alfreton Town) wins a free kick. Attempt missed. William Haining (Hyde FC) right footed shot from outside the box misses to the right from a direct free kick. Adam Thurston (Hyde FC) wins a free kick. Foul by Michael Wylde (Alfreton Town). Danny Carlton (Hyde FC) wins a free kick. Attempt missed. Andrai Jones (Alfreton Town) left footed shot from outside the box is too high.